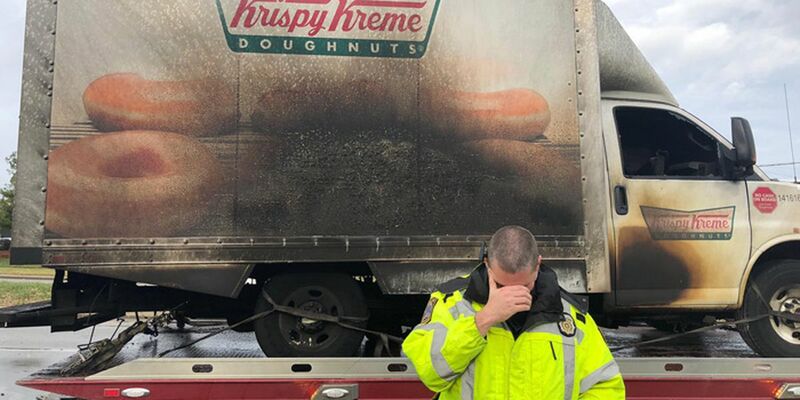 A few police officers in Kentucky had a sense of humor after a truck hauling some tasty treats caught fire Monday. Police forces and sympathisers around the USA were quick to offer condolences to their fellow officers in Lexington. According to WKYT, the truck was not actually carrying any doughnuts. The post is a nod to stereotype that law enforcement officers have an obsession with doughnuts. "We feel your loss", the University of Kentucky Police Department wrote. The photos touched the hearts of police officers across America, who shared their messages of support. Chicago police wrote, "Condolences from Chicago". "Prayers to LPD as they deal with this loss", said the Louisville Metro Police Department. "This literally hurts my soul", the department commented on Facebook, along with the hashtag "I donut think we can recover from this". "We're thinking of you during this hard time. and have more doughnuts on the way!"